The “project” is more like a range of initiatives to develop a deeper sense of community and solidarity among warehouse residents. Haringey Arts, a resident-led organisation, is the “spider in the web” of these initiatives. Although initially set up in 2008 with funding from Haringey council, Haringey Arts is since 2012 an independent organisation co-directed by local residents James West and Carolina Khouri. Haringey Arts focuses on supporting the development of a true warehouse community and facilitating initiatives by local artists that support this goal. One of their first initiatives was to open up the community on an Open Warehouse Day in May 2013. Haringey Arts works closely together with local landlords, most notably Provewell Ltd. Together they have set up a programme to develop the identity of the warehouse community through a series of commissions to local artists. These include a series of four destination signs, including a large mural on one of the warehouses’ façades. New commissions for 2015 include a fence upgrading project and a courtyard upgrading initiative to create permanent outdoor spaces for local residents to meet. In addition, local residents have started taking initiatives to promote the warehouse community. These include for example the inHouse Festival, first organised as a Film Festival in 2014, but now a broader event spread over many locations in the area. Haringey Arts supports these initiatives by acting as a platform, making connections between related stakeholders. Local residents can also fundraise for their initiatives via The Village Fund. Design, or rather, art, is used explicitly as a way to upgrade the area and define a local warehouse identity. 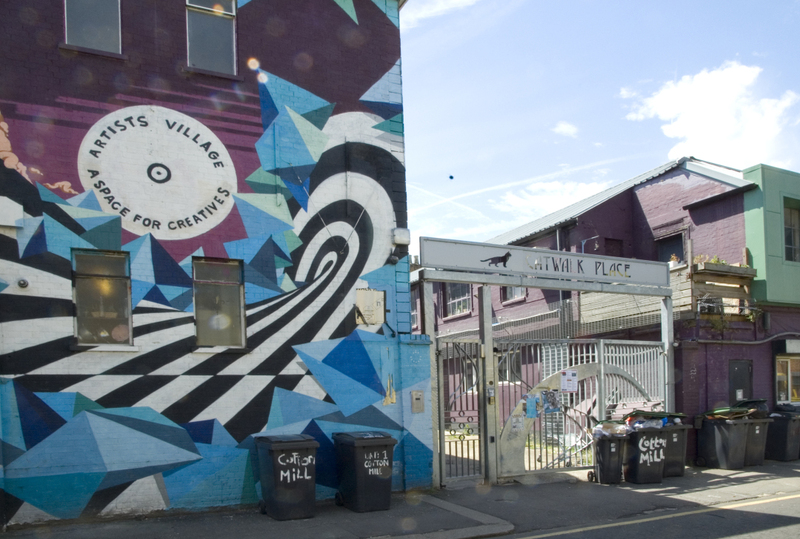 Yet there is no overall aesthetic plan or design – the main criterion to gain (financial) support from Haringey Arts is that an initiative / art project has to benefit the local warehouse community. Supported projects range from destination signs to public space upgrading. Projects are commissioned to local designers / artists to help them profit from the initiatives.